Ivor George Jenkins is something of an enigma and virtually no information exists about him in civil records. He was born on 4 April 1898, and it is known from military records that he was born in Neath, Glamorgan, Wales and lived in Yeovil, certainly at the time of his enlistment in late 1916 or early 1917. Prior to enlistment he worked at Sparrow's garage in Townsend and had a sister, Mrs WJ White who lived in St Michael's Avenue. Although it is not known when Ivor enlisted, he enlisted in Crewkerne joining 8th (Service) Battalion, Somerset Light Infantry. His Service Number, 27884, suggesting he enlisted during late 1916. He was sent to France on 5 April 1917. During 1917 the 8th (Service) Battalion, Somerset Light Infantry, including Ivor Jenkins, were involved in an inordinate amount of fighting including the First Battle of the Scarpe, the capture of Monchy-le-Preux, the Second Battle of the Scarpe, the Battle of Arleux, the Battle of Pilkem Ridge, the Battle of the Menin Road Ridge, the Battle of Polygon Wood, the Battle of Broodseinde, the Battle of Poelcapelle and the First Battle of Passchendaele. As part of the Arras Offensive the 8th Battalion took an active part in the First Battle of the Scarpe (9 to 14 April 1917), including the capture of Monchy-le-Preux, the Second Battle of the Scarpe (23 to 24 April 1917) and the Battle of Arleux (28 to 29 April 1917). The Arras Offensive was a major British offensive during the First World War. From 9 April to 16 May 1917, troops from the four corners of the British Empire attacked trenches held by the army of Imperial Germany to the east of the French city of Arras. Zero-Hour for the First Battle of the Scarpe had originally been planned for the morning of 8 April (Easter Sunday) but it was postponed 24 hours at the request of the French, despite reasonably good weather in the assault sector. Zero-Day was rescheduled for 9 April with Zero-Hour at 05:30. The assault was preceded by a hurricane bombardment lasting five minutes, following a relatively quiet night. When the time came, it was snowing heavily; Allied troops advancing across no man's land were hindered by large drifts. It was still dark and visibility on the battlefield was very poor. A westerly wind was at the Allied soldiers' backs blowing "a squall of sleet and snow into the faces of the Germans". The combination of the unusual bombardment and poor visibility meant many German troops were caught unawares and taken prisoner, still half-dressed, clambering out of the deep dug-outs of the first two lines of trenches. Others were captured without their boots, trying to escape but stuck in the knee-deep mud of the communication trenches. Most of the British objectives had been achieved by the evening of 10 April though the Germans were still in control of large sections of the trenches between Wancourt and Feuchy. On 23 April, the British launched an assault east from Wancourt towards Vis-en-Artois. The British made initial gains but could advance no further east and suffered heavy losses. Farther north, German forces counter-attacked in an attempt to recapture Monchy-le-Preux, but British commanders determined not to push forward in the face of stiff German resistance, and the attack was called off the following day on 24 April. In the Battle of Arleux (28 to 29 April 1917), although the Canadian Corps had taken Vimy Ridge, difficulties in securing the south-eastern flank had left the position vulnerable. To rectify this, British and Canadian troops launched an attack towards Arleux-en-Gohelle on 28 April. Arleux was captured by Canadian troops with relative ease, but the British troops advancing on Gavrelle met stiffer resistance from the Germans. The village was secured by early evening but, despite achieving the limited objective of securing the Canadian position on Vimy Ridge, casualties were high, and the ultimate result was disappointing. According to the Regimental History of the Somerset Light Infantry "The Battle of Arleux, fought on 28th and 29th of April, the 8th Somersets of the 37th Division again taking part in the operations, though the only Battalion of the regiment to do so. The front of attack was about 8 miles.... The attack of the XVII Corps was to be carried out by the 34th Division on the right and the 37th Division on the left.... Zero hour was 4:25am on 28 April. During the night of 27th/28th the eighth Battalion.... Moved forward from Heron Trench and assembled in Cuba Trench; the Battalion was in position by 3am on 28th, two platoons in front and two in rear, as each attacking battalion had been ordered to advance on a two-platoon frontage. It was so dark when Zero hour arrived that it was impossible to see more than 20 yards ahead, British and Germans being indistinguishable. Compass bearings had been taken and given to officers and NCOs, but even so, when the attack went forward, there was loss of direction. A few minutes after Zero a very heavy hostile barrage fell on the line of the road and the smoke, combined with the darkness, caused considerable confusion, with the result that the Somersets swung off to the left and Cuthbert Trench (directly east of Cuba Trench) was only partially attacked, the full weight of the attack passing on to Whip Trench, which lay some 500 yards east of Cuthbert." The First Battle of Passchendaele took place on 12 October 1917 in the Ypres Salient of the Western Front, west of Passchendaele village, during the Third Battle of Ypres in World War I. The Allied plan was to capture Passchendaele village. This was based on the incorrect assumption that during the Battle of Poelcappelle, three days previous, the attacking troops had captured the first objective line. In fact, the Allied front line near Passchendaele had hardly changed and the true position of the Allied front line, meant that the planned advance of 1,500 yards (1,400 m) was actually 2,000–2,500 yards (1,800–2,300 m). The assault was directly south of the inter-army boundary between the British Fifth and Second Armies and consequently pitted a collection of formations from both armies against the German Fourth Army. Despite advances on the northern front of the battlefield, the German's retained control of the high ground on Passchendaele Ridge and consequently the attack failed in attaining its principal objective. Although the battle was costly to both sides, the battle was considered a German defensive success. Further British attacks were postponed until the weather improved and communications behind the front had been restored. Following this series of battles, as winter set in and continuing through the first half of 1918, the intensity of fighting lessened somewhat although the landscape remained extremely dangerous and day-to-day fighting took a tremendous toll on both sides. Ivor Jenkins was killed in action during such day-to-day warfare on 5 April 1918 - a year to the day after arriving on the Western Front and a day after his 20th birthday. In its edition of 26 April 1918 the Western Gazette reported "Priv. Ivor G Jenkins, S.L.I., brother of Mrs WJ White, of St Michael’s Avenue, is reported as killed in recent fighting. He went to France on April 5th 1917, and met his death exactly a year later. He was formerly employed at Messrs. Sparrow’s Garage, Sherborne Road." In a different edition "Mrs W J White of 'Locarno' St Michael's Avenue, has received the distressing official intelligence that her brother Private Ivor G Jenkins, of the S. L. I., was killed in action during the recent heavy fighting on the Western Front. It is a sad coincidence that the deceased was drafted to France on April 5th, 1917, and was killed on the same date of the present year - a day after his 20th birthday. The deceased had been in the Army 18 months, and it is rather singular that on the same day when he arrived home from his final leave from France (February 29th) his brother-in-law, Private W J White and Sergeant Charles White (Military Medallist) both arrived home the same day. The deceased, who had only returned to France a month when he paid the supreme sacrifice, was previously employed by Mr Sparrow, Osborne Garage." 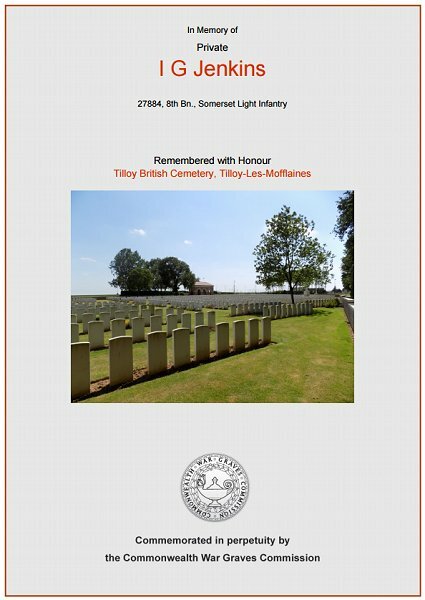 Ivor was interred in Tilloy British Cemetery, Tilloy-Les-Mofflaines, Pas-de-Calais, France - Grave V.B.16, and his name is recorded on the War Memorial in the Borough albeit incorrectly written as Jenkins, JG rather than Jenkins IG. The Commonwealth War Graves Commission certificate in memory of Ivor Jenkins.